Fantasy readers love a paratext— dramatis personae , glossaries, and, particularly, maps of exotic, far-off, and non-existent lands. I am, of course, no exception, having inhaled Anne McCaffrey's The Dragonlover's Guide to Pern at an impressionable age, and so when given the opportunity to read and review Swedish creative writing instructor Stefan Ekman's aptly titled Here Be Dragons: Exploring Fantasy Maps and Settings , I jumped at the opportunity. But this rumination on fantasy landscapes is uneven, at best; it lacks the delicious density of most fantasy paratexts themselves and eventually wanders into more pedestrian literary criticism. Ekman returns to the example of Tolkien again and again throughout Here Be Dragons , but his analysis is never as astute as in this first chapter—in his suggestion that this Shire map indicates not just a present but a "constant present" (p. 49), untouched by Saruman's destruction but also by the Hobbits' own alteration of the landscape, such as their camps or cut-down trees. And yet this same map indicates a temporal past, through names such as "Old Forests," a history mirrored by that of a text which likewise suggests "older villages." These observations are striking and quite well-researched. Ekman's survey of maps is extensive, and this is not only evident through the book's appendix but through the ease with which he makes these assertions. But as he proceeds through the remaining three chapters of Here Be Dragons , Ekman's focus becomes both diffuse and oddly focused on a small sample of examples. The following chapter, on "Borders and Boundaries," follows closely on the heels of the first in discussing threshold spaces and borderlands between "real" places and apparently fictional places, such as Faerie, within fantasy novels. Discussion of Wall in Neil Gaiman's Stardust is especially astute ("The route from Wall to London is offered as a pattern for further extension," Ekman notes, "From London, the reader can extend the story world to Cardiff, or Vancouver, or Auckland" [p. 83]). But soon Ekman begins to discuss fantasy polders, enclosed domains where the laws of the universe differ from those in the spaces external to them. Ekman once more discusses Tolkien—his apparent Ur-example for all fantasy setting tropes—but his other examples seem, perhaps, oddly chosen (Pratchett's Djelibeybi and Holdstock's Ryhope Wood), particularly when one realizes what he's overlooked. Narnia is a conspicuous absence here, particularly when Ekman muses at length about fantasy polders and border spaces between realms where time operates differently from the lands external or adjacent to it. And while the chapter on "Borders and Boundaries" seems to have a close relationship with Ekman's earlier, excellent analysis of fantasy maps, the two final chapters (on the relationship between nature and culture and finally, and on political structures within fantasy realms) feel quite a bit less relevant—and quite a bit more pedestrian. In each, Ekman chooses a handful of representative examples from either Tolkien or fantasy novels seemingly chosen at random, and discusses each, in turn. Yet though he's eventually, ultimately able to draw his argument back to geographical features such as the type one might see on maps in his discussion of the impact of evil characters, races, or cultures upon landscapes, these arguments felt more imprecise and certainly less insightful. He even notes, in his introduction to the chapter on "Realms and Rulers," that much of the discussion is not particular to fantasy landscapes themselves. 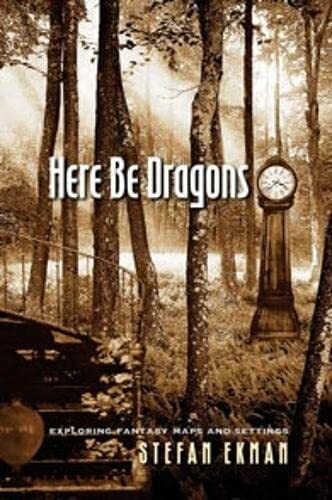 Here Be Dragons starts with promise, but unfortunately meanders into familiar territory. I would have easily inhaled two hundred plus pages on fantasy maps alone, because Ekman's analysis is full of insight. But I could have happily left the broader discussions of setting by the wayside—no new dragons are uncovered here.